Wood sorrel looks a lot like a large shamrock. Its heart-shaped leaves are folded through the middle, and grow in groups of three. The stalks are long, thin and leggy. Pushing upward from the leaves are smooth-skinned almost delicate looking flowers. Leaf and flower color can vary depending on species. Flowers are usually white or yellow, sometimes red or violet. In my neighborhood, Common Yellow Wood Sorrel (show in far-right photo above) grows as a wild guest in lawn and garden shaded areas. Dense clumps form in Spring, lasting up until the blazing summer heat kicks in around mid May. It likes to grow in fields and disturbed soil. Another identifying trait is that the flowers and leaves contract at night and when it rains. They open during sunlight hours for photosynthesis. 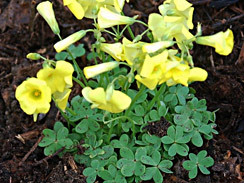 Wood sorrel has a tangy lemony taste. Flowers and leaves add flavor and visual appeal to salads, and as garnish to tart desserts. Leaves chewed on the trail quench thirst. Leaves combined with sweeteners and liquid make a lemonade-like drink. Pods are edible. Juice can be extracted as a vinegar substitute, and is sometimes used in cheese making. My favorite use is as garnish for lemon desserts. The flowers are beautiful on curd. 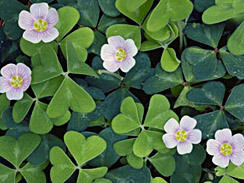 Wood sorrel is known by many names, including sourgrass, Oxalis, alleluia and false shamrock. Its name varies according to variety as well, including common wood sorrel, common yellow wood sorrel, yellow wood sorrel, mountain wood sorrel, violet wood sorrel, etc. Like spinach and broccoli, this plant contains oxalic acid. Because oxalic acid interferes with food digestion and mineral absorption, folks sometimes classify wood sorrel as slightly toxic. However, these effects are of little or no consequence with normal culinary use. You’d have to eat a tremendous amount for it to become a problem. Juice lemons. Keep as much pulp as possible with the juice. Place in medium saucepan. Beat eggs until creamy, add to saucepan. Add sugar and diced butter. Over medium low flame, bring mixture to a low simmer, being sure to stir consistantly. Too much heat will burn the mixture, and frequent stirring prevents the eggs from clumping. Allow to simmer for at least five minutes while curd thickens to the consistency of thin pudding. It will solidify a bit after cooling. 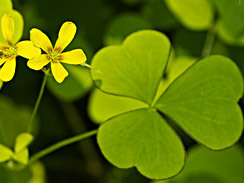 Garnish with wood sorrel flowers and leaves. Best served chilled overnight.